Hong Kong is well known for its hiking tracks and beautiful views. 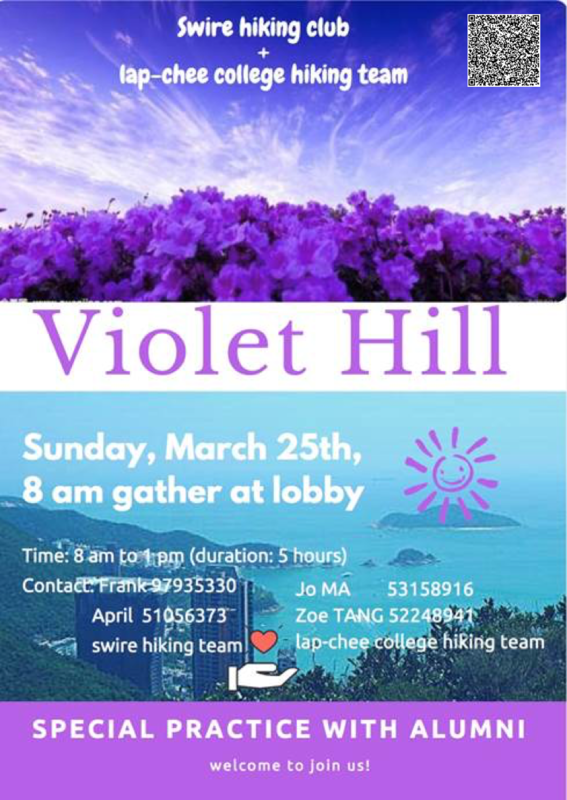 Join us now to hike up to the Violet Hill this Sunday. Violet Hill, also known as Tsz Lo Lan Shan (Chinese 紫羅蘭山, literally meaning violet (flower) hill) is located within Tai Tam Country Park in Hong Kong. It offers beautiful views of Tai Tam Reservoir Group and Wong Nai Chung Reservoir. A rare and protected species, Hong Kong iris (Iris speculatrix) with violet flower can be found on the hill. This event is organized by Lap-Chee College hiking team and Lap-Chee College Ambassador Team with Swire hiking time. If you would like to have a nice Sunday with your friends in Swire but have no idea where to go, just come and join us! Please register by scanning the QR code or using the following link.